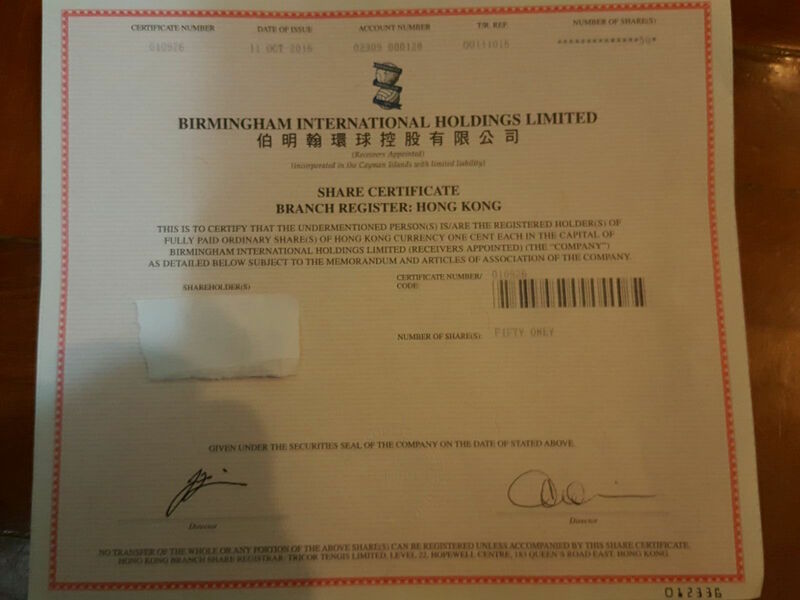 Birmingham International Holdings have confirmed in an announcement to the stock exchange that trading in shares in the company will resume trading at 9am on Monday morning. This confirms that the takeover is done; the new board and the conclusion of investigation into allegations made against the former board. As it’s a long, long announcement I need time to read this and so will produce my full analysis either later tonight or tomorrow. For now, I’ll leave you with a picture of my friend’s new share certificate in BIH. A great final document to confirm the takeover. Also gives decent in-depth descriptions of new Directors of BIHL……. All very interesting and shows what a brilliant job done by E&Y to save OUR Club from those *!&$*ds. Halllelujah! A corner has been turned! I wish all Bluenoses the very best. I see Often Partisan got a mention in the document in relation to PP’s comments on here – Dan you’ve made it!! Dan, you took on the establishment and won. A huge THANK YOU from me. Take a bow Dan, take a bow! Very good that OP gets an honourable mention for its public forum, slap on the back time for Daniel and his colleagues in HK, maybe I am reding it too quickly, but I see no word on Panos, please put me right if I have missed it. Better times ahead for all and so deserved after the trauma of the last few years. To be fair we have coped more than most clubs who have been thru traumatic times but its now finally looking over. I also want to thank you Dan for keeping us in the frame off whats happening but also always giving us hope thru those dark days. It has been tough these last few years as you and all bluenoses would agree but now we can now be like a normal football club and not have a huge dark cloud of uncertainty hanging over us. The nightmare is finally over.Those rat mothers have been flushed down the drain. Here’s to a brighter future.Dan a massive thank you for all you’re hard work,persistence and sheer hard work in keeping us informed.If I was King for the day then I would give you a Knighthood.Thank You. Well done Dan. Thank you. I genuinely think Carson’s intentions where to make blues a great club. The Co-incidence of CY being in charge when we won the League Cup does not warrant a thank you. Blues have been a better club without him than with. This period has regalvanised our belief that Blues is a tough fighting no nonesense club.